Our next Social Affairs Forum and study visit at CSV UK will take place on 9 and 10 March 2015 in London. Please register here. The agenda will follow in due time. SOLIDAR constituted a transversal advisory group on asylum, migration and integration coordinated by our Italian member ARCI with the support of the Secretariat. The political reason for creating such a taskforce is that - despite the fact that migration is currently a very relevant political, social and cultural matter - a common approach has not emerged. On the contrary, migration more and more became a divisive question between different political and cultural visions on the future. The aim of the advisory group is to work together on a common approach on the issues of asylum, migration and integration by providing a platform to better understand the challenges that civil society organisations are facing at local level as well as to share knowledge about practices that SOLIDAR members are carrying out. A brainstorming meeting will take place on 10 February from 10:00 to 13:00 at SOLIDAR Offices. The aim of the brainstorming is to make a first exchange with members on the priorities, objectives and expectations about the work of this advisory group in 2015. Please also note that the brainstorming meeting will be followed by the SOLIDAR-CGIL round table Rights-based approach to EU migration policies: the role of the Trade Union Network on Mediterranean and Sub-Saharan Migrants that will take place on 10 February from 15:00 to 17:30. If you are planning to participate in the brainstorming meeting, you are kindly invited to attend the round table as well. Please register here. The final report of the Europe for Citizens project ‘Real Civil Society Democracy in Europe’ is now available here. This project was led by SOLIDAR Danish member Forum for International Cooperation(FIC) and included amongst project partner SOLIDAR, CSV (UK), La ligue de l’Enseignement (France) and partners CGIL (Italy) and IDEAS (Ireland). As accurately illustrated in the report, the objective of this project was to raise awareness in the public and political systems at national and European level about the value of an organised and systematic participatory model for involving civil society organisations in European policy making processes. 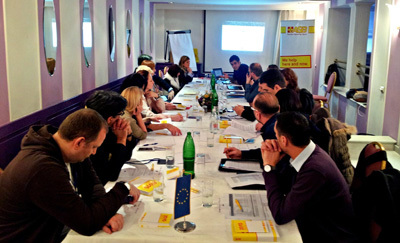 On 22 January the first meeting of second phase of the project "Improving the provision of Social Services Delivery in South Eastern Europe through the empowerment of national and regional CSO networks" took place in Brussels. The project, led by SOLIDAR member ASB South East Europe, is funded by the European Commission’s Instrument for Pre-accession Assistance (IPA). One of the most relevant outcomes of the first phase of the project was the creation of the IRIS network, a regional network of CSOs from SEE working in social service delivery. IRIS brings together national networks of CSOs from Albania, Bosnia and Herzegovina, Croatia, Serbia, Macedonia, Montenegro and Kosovo. The main and the most important goal of IRIS is to improve social care for vulnerable people who do not have access to proper services provided by the local or the national government. A fresh start for TTIP negotiations? 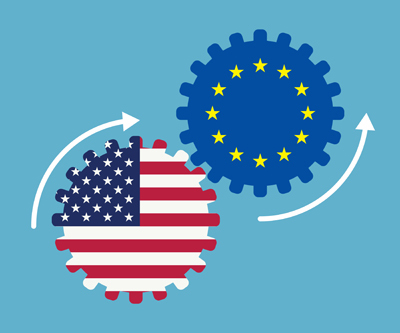 On 21 January, the European Parliament Trade Committee debated a working document prepared by its chair Bernd Lange MEP that seeks to give a fresh start to the Transatlantic Trade and Investment Partnership (TTIP) negotiations. SOLIDAR welcomes this initiative of the Parliament to express its position and in particular to define proper parameters for trade to support sustainable economic growth and the creation of good and stable jobs in the EU and beyond, as well as its recognition that TTIP is not a ‘magic wand’ to solve Europe’s economic problems. On Wednesday 14 January the Prime Minister of Latvia, Laimdota Straujuma, presented the key focal points for the upcoming six months. 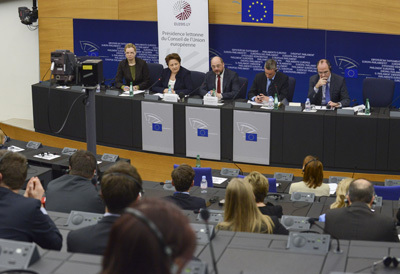 Latvia’s aim is to help Europe become more competitive, stimulate Europe’s drive to grasp the opportunities arising from further digitalisation and to move towards a Europe that is ready to be more engaged within the global arena. The aim is to return to a Europe of economic growth that can facilitate investment and deliver on jobs. 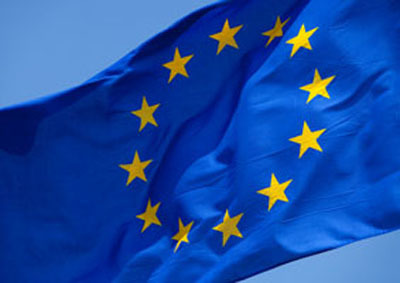 On Wednesday a further item was added to the list at the request of the European Parliament: a new approach to security. 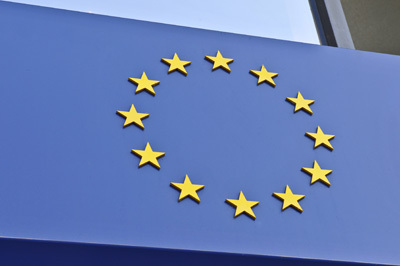 On 8th January 2015, the European Commission published its “Employment and Social Situation Quarterly Review: December 2014” giving an overview of developments of employment and social conditions in the EU over the last 3 months. As Commissioner Thyssen stated: “Though the employment growth we witness now is positive, it is still too small and too slow. Especially long-term unemployment remains a crucial challenge for the EU.” “The unemployment rate of young people has fallen significantly in the EU but remains very high. Long-term unemployment is a growing problem in the EU. In the second quarter of 2014, a total of 12.4 million people (5.1% of the labour force) had been unemployed for more than one year, and more than half of these had been unemployed for more than two years. In Greece and Cyprus, long-term unemployment rates have reached historic highs. Fragile economic recovery and challenges in the labour market have impacted on the modest developments in the situation of households and individuals. The easing in financial distress in low-income households, observed in the first half of 2014, appears to have halted in recent months”, the report states furthermore. SAF and study visit: 9 and 10 March 2015, CSV UK - Please register here. Extraordinary General Assembly SOLIDAR and evening reception 20 years SOLIDAR in Brussels (Brussels): 16 March - Please register here.